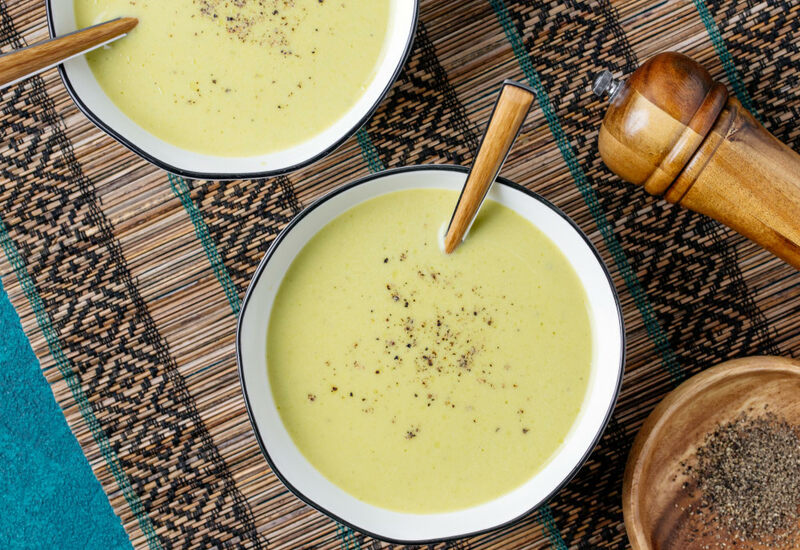 This creamy asparagus soup is sure to be a welcome addition at your next brunch! The Brie adds a subtle flavor and contributes to the creaminess of this soup, without being overpowering. It is ready in less than 30 minutes, so you can also make it for a quick weeknight dinner. It is quite delicious paired with smoked salmon or crab crostini. Serve a crisp glass of white wine, like Sauvignon Blanc or Pinot Gris to go along with it. Select Sauté on the pressure cooker and heat oil over medium heat. Add shallots and garlic and stir until fragrant, about 1 minute, taking care not to burn them. Add asparagus to shallot mixture and stir to combine. Continue to sauté until asparagus are tender, 3 to 4 minutes. Pour chicken broth into pressure cooker. Add salt and pepper. Press Cancel. Lock pressure cooker lid in place and set steam vent to Sealing. Select Pressure Cook (Manual) and cook on High pressure for 5 minutes. Set steam vent to Venting to quick-release the pressure. Add Brie cheese to the pressure cooker. Blend the soup using an immersion until creamy and smooth. Stir heavy cream into the soup. Season with additional salt and pepper if needed. If you do not own an immersion blender, you can use a regular blender. Work in batches to blend, filling no more than half full. Loosely place lid over top and cover with a kitchen towel to protect from hot splashing liquids. Try different cheeses besides the Brie cheese! Freshly grated Gruyère cheese or Parmesan cheese add a nice rich flavor. Switch in vegetable broth for the chicken broth for a vegetarian version. Per Serving: 170 calories; 13g fat; 7.9g carbohydrates; 7g protein; 34mg cholesterol; 837mg sodium. This is usually a recipe I would make in the spring, but I've been craving asparagus and decided to try it out now that the weather is cooling down. I used vegetable broth instead of chicken broth and added a little extra Brie cheese. Really good recipe. I used a blend of Gruyère and Parmesan cheese (preference) and used 1/4 onion instead of shallot. Probably one of my top three soup recipes of all time. Bravo. I left out cheese and cream, and instead used onions and avocado. I only had 1/2 avocado but I would add a whole one next time. It adds the fat and creaminess I like and makes it diary free.